Physicians confront many challenges in their career. Malpractice lawsuits are one of them, and many physicians are caught off-guard when a lawsuit hits their desk. 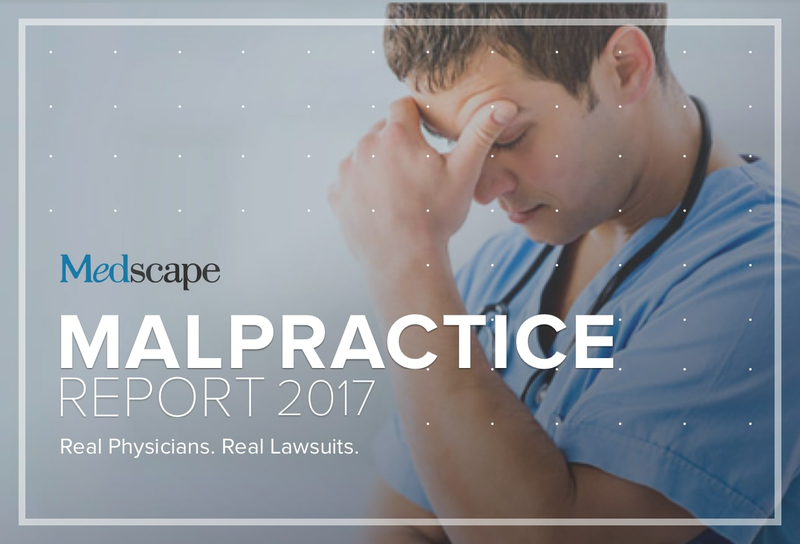 Medscape's Malpractice Report 2017 provides insights from more than 4000 physicians across 25+ specialties on how malpractice lawsuits affected their lives, why they were sued, what happened with the case, and how it has affected the way they practice medicine. Malpractice lawsuits are sometimes unavoidable. More than half of physicians have been named in a lawsuit. Almost half (48%) were involved in suits where other parties were named, while 13% were involved in suits where they were the only person named. Specialists were more likely than primary care physicians to have been named in a malpractice lawsuit. Among specialists who were sued, 13% were the only person named and 50% were one of multiple physicians named; among primary care physicians, it was 11% and 41%, respectively. Not surprisingly, surgeons and ob/gyns take the lead (85% of both groups) in being sued. The specialties sued most often also tend to have the highest malpractice premiums. While premiums vary, according to the Medical Liability Monitor, general surgeons in New York may pay a $141,600 annual premium and ob/gyns could pay $195,900, while internists in New York may be paying $37,800. As if dealing with one lawsuit weren't bad enough, many physicians are named in multiple lawsuits. Among physicians sued, more than half have been named in multiple suits. Almost half (49%) have been sued two to five times. One fourth of physicians working in a hospital were named in two or more lawsuits, and almost one fourth (23%) of physicians working in office-based single-specialty group practices were sued two or more times. Primary care physicians (18%), surgeons (11%), and ob/gyns (11%) were among the doctors most often named in two or more suits. Malpractice lawsuits can catch physicians off-guard. Among physicians sued, nearly 6 in 10 were surprised by the suit. Almost one third (29%) were somewhat surprised, and 13% weren't surprised at all. Among all physicians, the top reasons for a lawsuit were failure to diagnose or a delayed diagnosis (31%) and complications from treatment or surgery (27%), followed by a poor outcome or disease progression (24%). Primary care physicians were most likely to be sued for failure to diagnose/delayed diagnosis (43%) compared with 28% of specialists. Among specialists, complications from treatment/surgery was the top reason for a lawsuit (31%), compared with 15% of primary care physicians. Improper informed consent and failure to follow safety procedures were the least frequently named causes of a lawsuit. Among physicians named in a malpractice lawsuit, 89% felt that the suit was unwarranted. Six percent weren't sure and 5% agreed that the suit had merit. The majority of male and female physicians (89% of each) feel that the lawsuit was not warranted. A slightly higher percentage of men said the suit was warranted (5% versus 4% of women). What helps make the specter of malpractice so distressing is that in many situations, there is no forewarning. Almost one half (49%) of physicians said that there was no event that sparked the lawsuit or would have alerted them to expect a suit. Over one third (35%) said there was such an incident, while 16% said they didn't recall the circumstance. Besides worrying about the outcome of a lawsuit, physicians have to deal with losing work time to prepare. One third of physicians spent more than 40 hours on their defense, including getting records together, meeting with their attorney, and preparing for depositions and discussions. Almost one fifth (16%) of physicians devoted 6 to 10 hours to these and other tasks, and another 16% allocated 11 to 20 hours of their time. For about a third of physicians, their cases were resolved early enough that they never went to court or a trial-related meeting. Still, about another third (36%) spent over 20 hours either in court or in meetings related to the trial. Nearly one in five were in court or meetings for more than 50 hours. Giving sworn evidence is an integral process in seeking the facts of the case. The information gained at depositions is often used to decide how to proceed with the case. The majority of physicians (81%) named in a malpractice lawsuit were involved in giving depositions. Defendant attorneys say that physicians sometimes get themselves into trouble during depositions by volunteering information that the plaintiff attorney can use to trip them up. Physicians who have been through depositions provided the advice above for other physicians. Slightly more than one fifth (21%) of lawsuits were resolved in under a year. Over one third (39%) of lawsuits were resolved in less than 2 years. Almost one third (30%) of physicians in our survey said that their lawsuit was settled before trial. Covering all types of lawsuits, the vast majority of cases do settle—from 80% to 92%, by some estimates. Of note, only 2% of respondents said the case went to trial and the jury decided against them. Losing a lawsuit can be financially devastating to both the practice and the physician's personal finances. Not surprisingly, almost all physicians (97%) said they have malpractice coverage. In a number of states, physicians are not required to carry malpractice insurance. In the first decade of the 2000s, "going bare" was an option chosen by a number of physicians; that option has since become less popular. In our survey, self-employed and employed physicians were equally likely to have malpractice coverage—98% of each. Physicians' insurers often exert influence over malpractice cases. Many policies have a "hammer clause," which gives the insurer power to enforce a settlement. In recent case law, however, the clause has been shown to rest on whether the insured's refusal to settle is unreasonable. Plaintiffs in malpractice cases often walk away from malpractice suits with a substantial financial award. Over two thirds of physicians (68%) said that in their cases, the plaintiff received up to $500,000; 17% said the plaintiff was awarded from $500,000 to $1 million. Of note, almost two thirds (62%) of physicians think that the outcome of their malpractice suit was fair. Over one third (38%) hold the opposite opinion. A malpractice lawsuit can change a physician's view on patients and healthcare. Over one fourth (26%) of physicians no longer trust patients or treat patients differently. Going through a lawsuit prompted 6% of doctors to leave their practice setting, while 3% of physicians decided to change their insurer. Malpractice lawsuits can be challenging and difficult, but only one third of physicians feel that the lawsuit negatively affected their overall medical career. About two thirds (67%) said the lawsuit had no negative effect. Slightly more female physicians (38% versus 32% of male physicians) felt that the lawsuit affected their overall medical career. Hindsight is 20/20, and looking back, physicians who were sued say they would have done things differently to avoid the suit. Better chart documentation was cited most often (22%), followed by never having taken on the person as their patient in the first place (12%). In 36 states, certain statements concerning disclosure or apologies are prohibited from being admissible in a medical malpractice lawsuit. Physicians are still skeptical. The majority of physicians in our survey (83%) do not believe that saying "I'm sorry" to the plaintiff earlier, or at all, would have made a difference in whether they were sued. Only 2% believe that it would have made a difference. Male and female physicians are on equal ground (83% of each) in the belief that saying "I'm sorry" earlier, or at all, would not have made a difference. For almost half of physicians (45%), the threat of lawsuits is on their mind all or most of the time. Many say that this is the motivation for so many physicians practicing defensive medicine. But 17% of doctors said they rarely have these thoughts. Self-employed physicians were more likely than their employed peers to report that the threat of malpractice is always on their mind. Slightly more self-employed than employed physicians (26% versus 24%) think about it most of the time. A third of physicians indicated that the threat of malpractice influences their actions all or most of the time. For most physicians (39%), the threat of malpractice occasionally influences their actions. Only 5% said that it never does. Although the potential for a malpractice suit is greater when dealing with high-risk patients, most physicians in our survey (84%) have not turned away such patients. Many malpractice insurers offer a risk audit to help physicians lower the malpractice risk at their practice. Still, over two thirds of physicians (67%) have not had nor plan to have a risk assessment. One fourth of physicians said that they have done so, and 8% expect to do so in the future. Half of physicians feel that the amount of worry they have about malpractice is appropriate—neither too much nor too little. One third feel that they worry too much. Politicians and medical organizations have promoted various ways to reduce the number of malpractice lawsuits. Better communication, having a medical panel screen cases for merit, and placing caps on noneconomic damages were each cited by over half (53%) of physicians as the most effective ways to discourage malpractice lawsuits. A more aggressive approach was making plaintiffs responsible for all attorney and legal fees should they lose. Two thirds of physicians gave a thumbs-down to major medical organizations' or state societies' efforts to reduce the number of malpractice lawsuits. Only 7% felt that these organizations were active enough in working to improve the malpractice environment. Glater J. Study finds settling is better than going to trial. The New York Times. August 7, 2008. http://www.nytimes.com/2008/08/08/business/08law.html Accessed October 15, 2017.